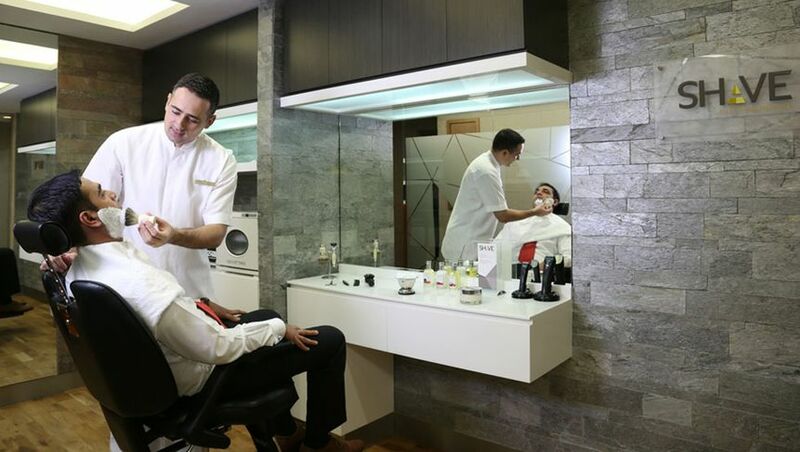 Etihad Airways has closed the Style & Shave salons at its flagship first class and business class airport lounges at Abu Dhabi, the latest in a series of cost-cutting measures taken by the Gulf airline which once wowed the aviation world with its indulgent A380 Residence 'flying penthouse'. A spokesman for Etihad Airways described the move as part of "changes to its service offering at the airline's Departure Lounges at Abu Dhabi International Airport." "As part of the adjustments, the Style & Shave facilities at Etihad's First Class Lounge & Spa and Business Class lounge at Terminal 3 will no longer be available." A similar facility at Etihad's Abu Dhabi arrivals lounge was shuttered in mid-2017. The Six Senses Spa at Abu Dhabi Terminal 1 has also been shuttered, also its Terminal 3 counterpart remains open, along with a clothes pressing service. The Shave and Style salons spoilt travellers with expert wet shaves, haircuts, beard trims, shoe shines, blow-drys and nail treatments. These were provided free to first class flyers, with business class passengers charged a nominal fee, such as AED55 (A$18) for a wet shave and AED75 (A$25) for a clipper cut. The salons were part of the ambitious 'Flying Reimagined' campaign designed to transform Etihad from being "that other UAE carrier" – alongside glitzy globe-striding neighbour Emirates – into a boutique operation which drew inspiration from the world of five-star hotels, fine restaurants and even private member's clubs. The Style & Shave salon closures mark the latest cut – no pun intended – in premium passenger services and follows the removal of chauffeur drive for business class and even first class flyers, no longer handing out inflight pyjamas in business class and imposing data limits on previously uncapped inflight Internet plans. Meanwhile, revenue-raising measures have included selling access to its airport lounges to economy class passengers – including Abu Dhabi's once-elite first class lounge. Etihad Airways has been hit by failed investments in Alitalia, Air Berlin and the Swiss-based Etihad Regional, and reported a US$1.9 billion loss for its 2017 fiscal year. Etihad, a skystrax 5 star airline. The slow death of EY continues. I wonder how long until they merge (AKA are bought for a song) into EK? I don't think a song will have to be paid. It may be just end up being gentlemanly agreement between two friendly rulers of neighbouring emirates (though they may hire a singer for the signing ceremony). Just as I started to visit! They are fogetting the reason so many people flew with them was the premium services they offered, now with the removal of so many of those services the reality is they are just another ME airline with long lay overs to get to EU. I have a reward J booking with them on the A380 in July via VA. Wonder if they will last that long, or if I should cancel now, and try to rebook SIA ? I know I'm an armchair CEO. But IMHO what EY is doing here is killing their own brand image that they took so long to establish. I don't know how much saving they'll have by cutting these premium services, but I would think it's nothing compared to the losses with all the other money loss making airlines. By cutting these premium services what they will be losing is the premium passengers which is where the money is. Wouldn't it be better if they just cut ties with all those other airlines, or do cost cutting on those? If they transform Alitalia into a LCC I don't think it'll hurt EY image at all. How many people know that EY owns Alitalia? But what they are doing is making EY look bad and the words will go out. Premium passengers will go to EK and QR which they know they'll get the service they paid for. As with Ansett, Gulf Air and now Etihad James Hogan makes unsustainable changes and ill thought business plans then makes a runner. Want to destroy your airline - hire James Hogan. Yes....another Gulf Air situation comes to mind. The former darling of the Middle East carriers with a huge network.....now scaled down and insignificant compared to EK, QR and EY. the bling of the middle east carriers starting to tarnish big time. I am flying through Abu Dhabi on Friday. As a time poor VA plat I was planning on getting a haircut and shave in the lounge during my layover. The decline of EY reminds me of what I saw when flying TG to Europe. 10+ years ago they had decent planes, good service and nice lounges in BKK. Over time the planes got older, the service got a little worse on each flight and the lounges never changed (the carpet was worn, the same food for years etc). It's been a few years since I burned all of my ROP miles. At first EY was a pleasant surprise. These days I alternate between SQ and EY for trips to Europe. It might be time to convince me clients that they should spend a little more on SQ flights in the future. As a VA Platinum I have access to the AUH F Lounge. It was a great experience no matter what class you were flying and provided a reprieve from an average Y experience (oh the cramped seats) and a very good, but surprisingly not that outstanding, J product (or am I just getting jaded with flying in any class?). As they whittle away the services that are add ons, it means my eyes will be turning to other carriers, with or without lounge access. SQ as first consideration, although I tend to be similarly underwhelmed with their J. So next EU trip will probably be SQ or similar in Y or PE. It never ceases to amaze me that the little things on board (in any class) are things that go in times of adversity, yet these are the very things that keep everyone happy. I’m still looking for the CEO that recognises this sort of thing and earns their keep by encouraging staff to pull together and be the heart and soul of their airline. Gosh, they might have to do some work for their salaries! Looks like we are now down to the Middle Eastern 2 - with Etihad bowing out of the race and leaving Qatar and Emirates to battle it out, and from where I sit (when flying of course) it looks like Emirates is also slowly being pushed into 2nd position. Qatar will be the front runner and justifiably so with their enhanced service, seats and aircraft types. If Etihad does not make some service focused changes and enhancement soon, they will forfeit their premium passenger loads and only attract Y passengers. Maybe that is their plan, as they are definitely not doing anything to attract Premium passengers loads anymore. They may have taken a recent financial loss, but it doesn't mean you just give up! Comment on "Etihad closes first class, business class Style & Shave salons "